The mirror is hangup on the wall. People look at their faces and their body. Seeing quickly in front of others but lonely, see full of heart. Look at different position. Seeing laughing, rage, and still feeling sorrow. Nevertheless it looks good to see. Whatever is in the eyes of others, reflection of mirror is his/her own shadow. The person who loves most. But beautiful? It can not be seen in glass chest. It Just be able to feel. The expression of that feeling is as artistic. Baul said in his song "আরশীনগরের কথা, যে-নগরে অপরূপের দর্শন হয়" Sung more "মন আছে তাের মনের ভিতরে।"
That shadow of the mind is reflect on that mirror city, one aspect of that city is as story and narrative. So, the name of this book is 'Manomukur'. In the name of the book, which will not be found in story. 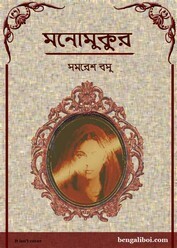 The above said novel 'Manomukur' has written by the prominent Bengali author Samaresh Basu. Collect the Bengali Novel as pdf download- 'Manomukur by Samaresh Basu'.